Beats Powerbeats Pro headphones boast 9-hour battery life and Apple's H1 chip | What Hi-Fi? At last, the new Beats Powerbeats Pro headphones are official. Images of these true wireless in-ears leaked a couple of weeks ago, and now we have the all-important specs and pricing. The headline news is that they feature Apple's H1 chip, the processor that features in the latest version of the Apple AirPods (2019). This means you can use them with Apple's virtual assistant, Siri, and the earbuds should also take advantage of the extra speed and wireless stability that the chip brings. Battery life for the Powerbeats Pros is a claimed nine hours from a single charge and, like most rivals, the Pro's carry case also doubles as a battery pack giving you an 15 extra hours. The Fast Fuel feature should give you around one and a half hour's charge in just five minutes and four and a half hours in just 15 minutes. Beats claims the Pros have been completely re-engineered, and use a new driver designed to reduce distortion, increase dynamic range and "create a powerful acoustic response in a small package". There's a new angled acoustic housing and the headphones also boast redesigned adjustable earhooks to help with fit. Four different sizes of ear tips are provided and it goes without saying the Powerbeats Pros are sweat and water-resistant. Interestingly, The Powerbeats Pros boast controls for playback and volume on both earpieces which should benefit right and left-handed users. 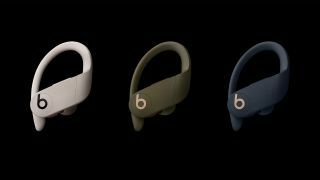 The Beats Powerbeats Pros go on sale in May for £220/$250 and will be available in four finishes: Black, Ivory, Moss and Navy.